Product Description: This formulation has been developed for soil drenching of vegetables. 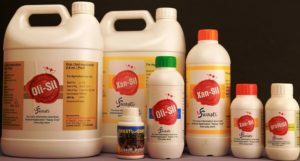 It prevents damage caused by soil nematodes and fungi. The formulation has been shown to kill pathogens by contact, paralyze nematodes, and build beneficial microflora. Product Description: This is an intermediate molecular weight formulation for promoting healthy growth of vegetables along with building disease resistance. The formulation induces callose synthesis and mimics defense biomolecules produced by the plant leaf surface.